“Washington was elected President as the unanimous choice of the electors in 1788, and he served two terms in office. He oversaw the creation of a strong, well-financed national government that maintained neutrality in the wars raging in Europe”. I peered down at a wide-eyed nine year old child after reading the first sentence in her informational writing. “Did you write this?” I asked skeptically, already knowing the answer. “Yes,” she replied with a wide smile. She had in fact written the sentence down on paper; what she had not realized that it was wrong to copy the sentence from wikipedia. We talk a lot about plagiarism in the upper grades, and why wouldn’t you combine writing with another subject in a grade that has so many facts to learn? The word plagiarism doesn’t mean a lot to a nine year old, unless you break it down for them. Every year, my class watches the All State commercial and talk about stealing sentences from the internet, but every year students’ papers are filled with plagiarized sentences. This year, while attending a workshop, I was shown how to use DASH notes. A way for students to jot down information they find interesting in a paper without copying sentences. The biggest problem I have found students have when researching is the fact that they don’t know they have to read a selection, gain knowledge from the piece, and write down what they find interesting. Google and Wikipedia are not our opposition. We want students to use these resources correctly. Since keywords are no longer absolutely necessary to find valid and relevant information, these resources are easier to use than ever! After a ton of modeling and implementing DASH notes in my classroom, I have noticed a drastic decrease in plagiarism being used. There is still a bell curve in this situation, and I am still teaching how to appropriately use and find information on the internet. However, the sentence thieves are dwindling! See the steps of our informational research project below. 1) The students collected questions they had on candy in general. 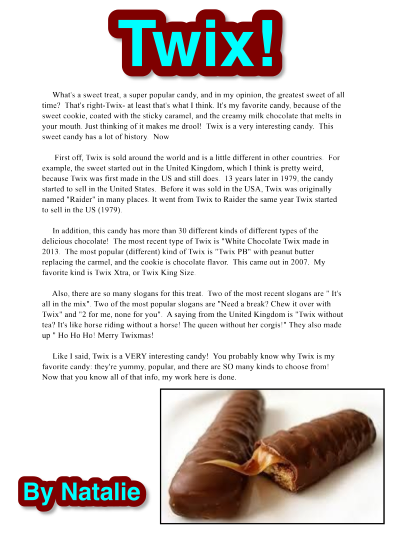 2) I gave out the “DASH notes” resource to students and modeled researching Sweethearts candy. 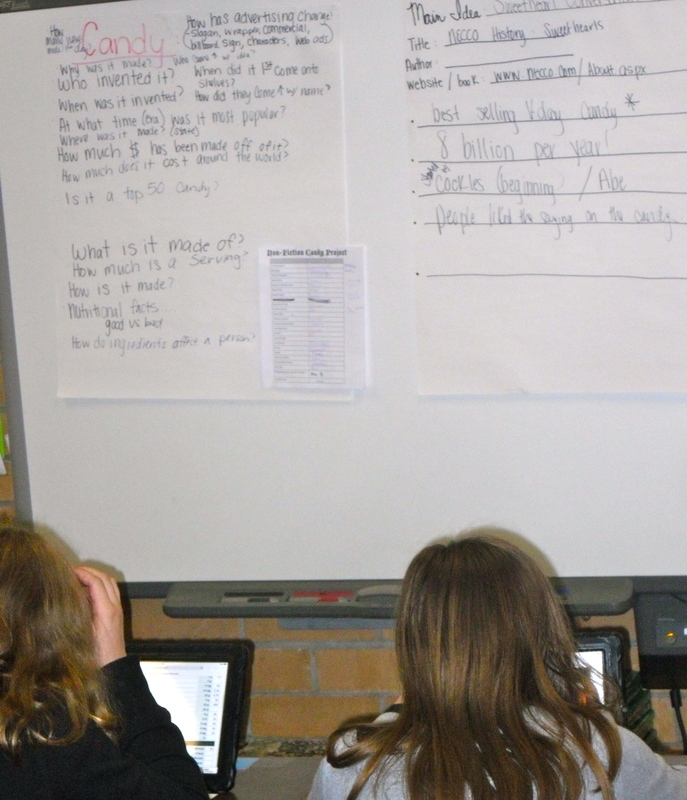 Students then had to READ, comprehend, and pick out facts they found interesting from an internet resource. 3) I checked off their DASH notes page to make sure I didn’t see any exact sentences being copied. 4) Students created 4-squares by grouping facts they found while researching together. For example, if they found out a lot of facts about the candy’s history, they wrote a paragraph about the history of the candy. You can even create 4-squares on iPads. 5) Students completed a rough draft using the resource below. 6) Finally, students typed their final copy into Strip Design and sent the final copies to Box, so I could print and grade their published work. We actually had a plagiarism conversation in my class today. Often, students will get a book I have read to to them to copy a name or vocabulary word for their own writing. Several students were looking at/reading books about space to add details to their writing. Two little girls were straight up copying sentences. Teachable moment! “The words in the book are the author’s words, not yours. It is ok to copy a word or two to help us spell, but we can’t copy sentences and saw they are our own.” I then hinted at it being illegal! ☺️ Hopefully, they will remember this by the time they get to you in a few years! Wow! What a teachable moment. Hopefully, this moment helped them understand the difference.